Thank you for visiting our website. 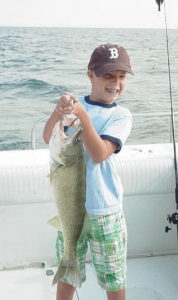 We know there are lots of choices out there when it comes to Lake Erie charter fishing, and we appreciate you considering Lucky Duck Fishing Charters. We strive to make your fishing experience the most enjoyable one possible. Captain Rick Comstock offers full service charters operating out of Vermilion, OH. Lucky Duck Sport Fishing caters to all skill levels and fishing interests, both young and old alike, with drift and trolling trips available to suit your needs. So come along and let’s go fishing! Lake Erie fishing charters are available April through November. The 2019 Lake Erie walleye season is promising, with a nice mix of fish sizes. The previous 3 years have all yielded nice hatches of fish, evident by the numbers of small fish caught during the 2015 season. The reports indicate that the 2015 hatch may be as large as the record hatch in 2003. This is great news for the upcoming seasons! The season is long, so customers have plenty of time to pick the fishing days that suit them and their schedules. But keep in mind that booking early ensures that you will get the days you want for your Lake Erie fishing experience. Customers who don’t have the right gear for big lake fishing need not worry. The Lucky Duck carries good rods, reels and tackle for both drift fishing and trolling, that customers can use at no extra cost. We provide all the tackle you need for an enjoyable family experience. Lucky Duck Charters also offers multi-boat charters for large groups, plus all-inclusive executive trips where food and fish cleaning are provided. Combo trips are offered for walleye and perch August through October where you can fish for more than one species. Captain Rick will also help you find comfortable lodging near the dock to make your Lake Erie fishing charter memorable. People of all ages enjoy Lake Erie fishing because it’s exciting! And families are always welcome on the Lucky Duck, which is big, safe, clean and well maintained, and Coast Guard inspected for your safety. Captain Rick is always courteous, professional, and attentive to your needs. So plan your fishing charter experience for 2019 now! Call us today at 440-522-9669 for exciting Lake Erie fishing with us on the Lucky Duck! If you need to purchase a Fishing License, click here. Lucky Duck Charters is a premier charter company offering some of the best Lake Erie fishing around. So if you are looking for the finest fishing spots in the Ohio area then let the best Lake Erie fishing charter take you out and show you the best spots. Let our 30 years of experience show you the best time possible on the lake.